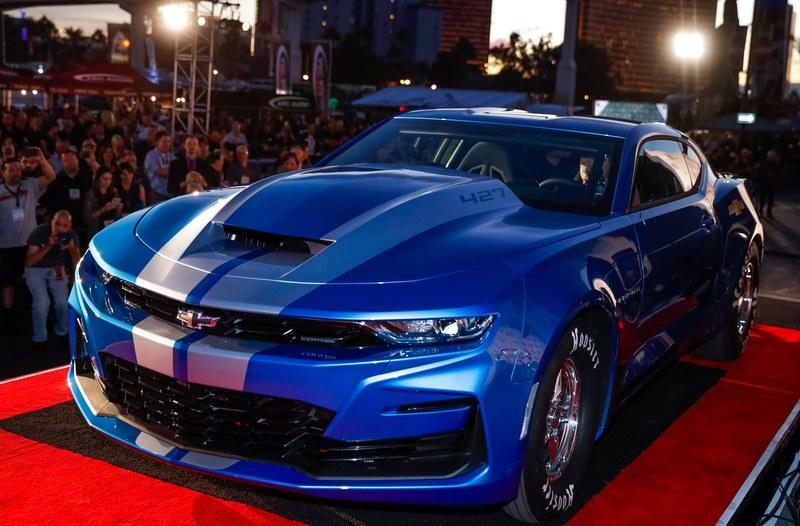 What Makes the 2018 Chevy ECOPO Camaro Race Car Concept Special? On the outside, the eCOPO is pretty much a regular COPO Camaro. Sure, thre are few noticeable changes compared to the standard dragster, but nothing that would really suggest there’s an electric drivetrain under that muscle car body. The first differences that catch the eye when comparing the eCOPO to the new COPO is that the EV has a smaller hood bulge. This makes sense though, as while the COPO hides a massive, supercharged, 7.0-liter engine between the front wheels, the eCOPO draws juice from a much smaller motor. The eCOPO also has new graphics on the hood. 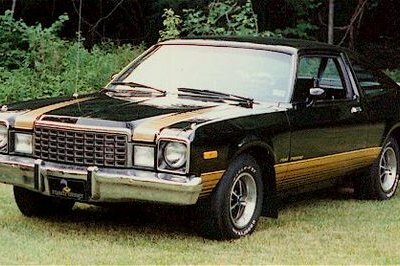 There's "800 Volts" lettering instead of "427" and lightning decals instead of "go-fast" stripes. 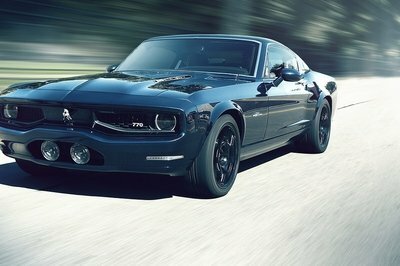 Lightning is obviously a hint about the electric power moving this coupe. Chevy did not release photos of the interior and had nothing to say about it, but it’s safe to assume it’s identical to the regular COPO. It should be packed with safety features, including an NHRA-approved roll-cage, and all you need to say safe in case something goes wrong on the quarter-mile run. However, the eCOPO probably has a bespoke instrument cluster that provides information on battery usage and EV-related performance. The eCOPO is an entirely different car under the skin, as the traditional V-8 was replaced by a new electric electric motor developed by General Motors. Based on a pair of BorgWarner HVH 250-150 motor assemblies, it cranks out "more than" 700 horsepower and a solid 600 pound-feet of torque. 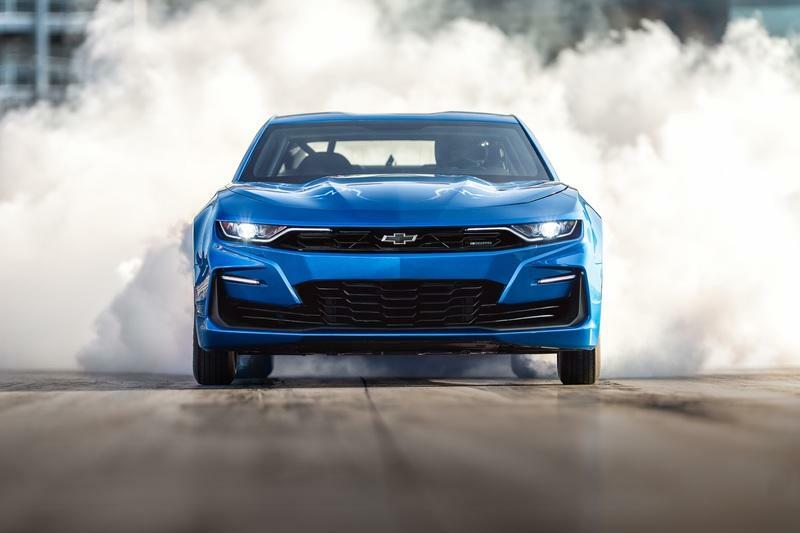 Chevrolet estimates quarter-mile times in the nine-second range. 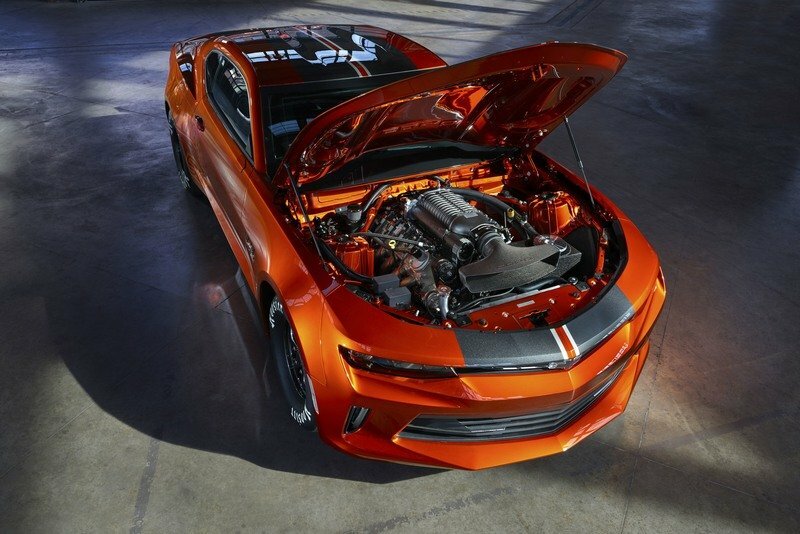 That’s around a second slower than the quickest version of the gasoline-fed COPO Camaro, but Chevy is still testing the car. 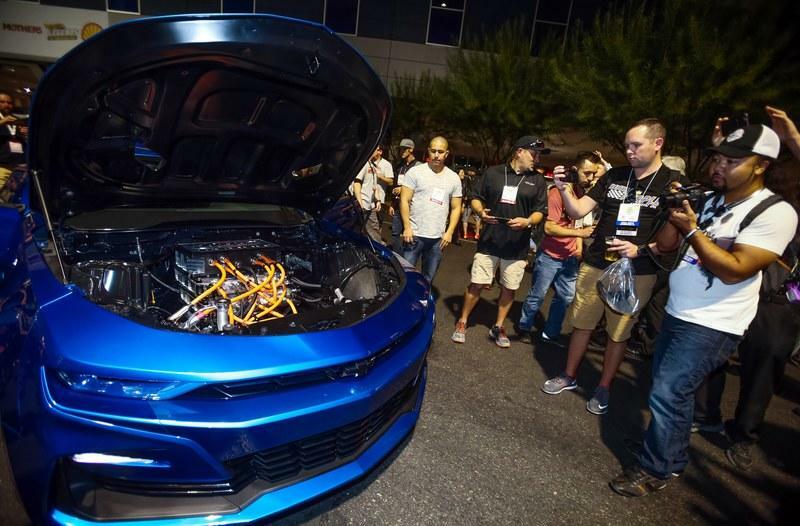 GM claims it’s breaking new ground with its first 800-volt battery pack, which provides more than twice the voltage in the Volt and Bolt production models. The big battery also enables a more efficient power transfer to the motor and supports faster recharging. The latter feat is extremely important for the limited time between elimination rounds in drag racing. Chevy also took plenty of safety measures to ensure that the eCOPO doesn’t become dangerous at the race track. The batteries in the rear compartment are sealed off from the interior and an integrated driveshaft tunnel has been added between the modules for increased protection. Additionally, the roll cage in the trunk area has been expanded to provide additional protection for the rear-mounted modules. This also gives the eCOPO Camaro a 56 percent rear-weight bias, which helps launch the car more efficiently. 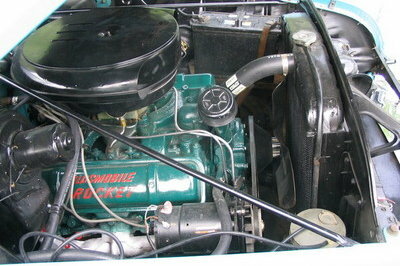 Interestingly enough, the motor mates to a conventional “Turbo 400” automatic transmission and the same solid rear axle used in the production COPO Camaro race cars. The motor also has the same bell house mounting pattern and crankshaft flange as the popular LS unit in Chevrolet’s crate engine portfolio. 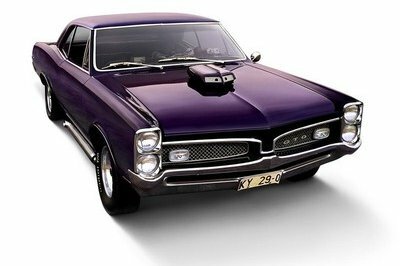 This allows it to bolt up to just about any transmission from GM, while the driveshaft and other drivetrain components remain in the same locations as in a gasoline-powered COPO Camaro. In short, the electric motor simply bolts into the engine compartment in place of the gas engine, which means that it probably has a future as a crate "engine" in the lineup. 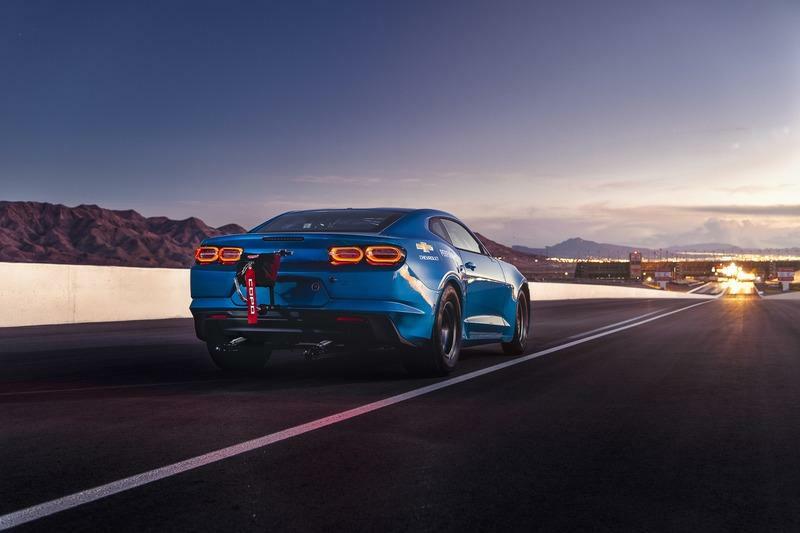 Read our full review on the 2019 Chevrolet Camaro. 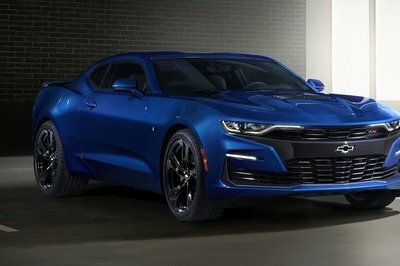 Read our full review on the 2018 Chevrolet COPO Camaro. 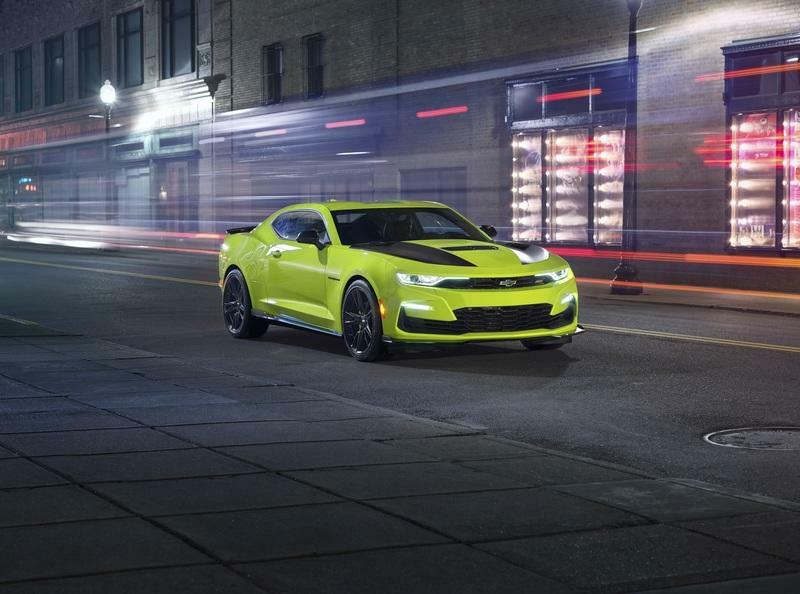 Read our full review on the 2019 Chevrolet Camaro SS Shock.